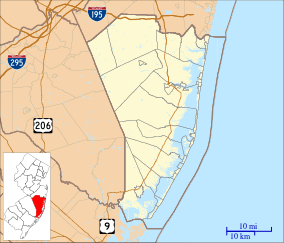 Central Regional High School is a four-year regional comprehensive public high school serving students in ninth through twelfth grades, located in the Bayville section of Berkeley Township in Ocean County, New Jersey, United States, operating as part of the Central Regional School District. The high school serves students from the municipalities of Berkeley Township, Island Heights, Ocean Gate, Seaside Heights and Seaside Park. As of the 2013-14 school year, the school had an enrollment of 1,309 students and 97.9 classroom teachers (on an FTE basis), for a student–teacher ratio of 13.4:1. There were 347 students (26.5% of enrollment) eligible for free lunch and 80 (6.1% of students) eligible for reduced-cost lunch. The school was the 239th-ranked public high school in New Jersey out of 339 schools statewide in New Jersey Monthly magazine's September 2014 cover story on the state's "Top Public High Schools", using a new ranking methodology. The school had been ranked 264th in the state of 328 schools in 2012, after being ranked 257th in 2010 out of 322 schools listed. The magazine ranked the school 273rd in 2008 out of 316 schools. The school was the 272nd-ranked public high school in New Jersey out of 316 schools statewide, in New Jersey Monthly magazine's September 2006 cover story on the state's Top Public High Schools. Schooldigger.com ranked the school 240th out of 376 public high schools statewide in its 2010 rankings (an increase of 6 positions from the 2009 rank) which were based on the combined percentage of students classified as proficient or above proficient on the language arts literacy and mathematics components of the High School Proficiency Assessment (HSPA). The Central Regional High School Golden Eagles compete in the Shore Conference, an athletic conference made up of private and public high schools centered at the Northern Jersey Shore. All schools in this conference are located within Monmouth County and Ocean County, which operates under the jurisdiction of the New Jersey State Interscholastic Athletic Association (NJSIAA). With 895 students in grades 10-12, the school was classified by the NJSIAA for the 2014-15 school year as South Jersey, Group III for most athletic competition purposes, which included schools with an enrollment of 772 to 1,082 students in that grade range. Central High School graduate Willie Jacobs became the school's new football coach for the 2013 season. He is the 5th head coach in ten years following Vincent Casale, Dennis Tobin, Dean Helstowski, and Dan Duddy (who led the team to its only state sectional final in 1994). The team qualified for the state sectional playoffs in 2013, losing to eventual champion Delsea. In 2014 season central regional would then become B-South champions for the first time since 1994 and get their first ever home playoff game (which would be held at Toms River east, since their field was under construction). They would go on to the state semifinals and lose to Allentown which would become state champions. On November 27, 2014 Central Regional would be playing on their own turf field for the first time in school history. Coaches: Head- Jeffery Mangold The girls' volleyball team was created during the 2009-10 school year. The team consist of 22 girls. The Central Regional wrestling team has enjoyed several successful seasons and has produced some outstanding individuals as well. In 1968, Alan Hess became Central's first ever New Jersey state medalist finishing in fourth place (out of four) without winning a match. In 1973, Mike Baeli became the first wrestler to win a match at the state level, finishing fourth after defeating Art Kubo in the first round. In 1985, CR crowned its first NJSIAA state champion, the late Darnell Myers, under the guidance of coach Paul Mueller. Brothers Mark and Maurice Worthy won a combined five NJSIAA Championships, with Mark Worthy becoming one of only two dozen wrestlers to have won three state titles, winning in 1996 (112 lbs. ), 1998 (140 lbs.) and 1999 (145 lbs. ), while his brother Maurice Worthy won titles in 1996 (152 lbs.) and 1997 (160 lbs.) Maurice went on to a runner-up finish in the NCAA Division I Championships while attending the United States Military Academy at West Point. The team had a successful run in the mid-1990s under long-time head coach Pat Lynch who crowned 4 Region Champions and was named Region Coach of the Year. Mike Bischoff, took over the reins of the program upon Lynch's retirement in 2003. For his efforts, Bischoff would twice (2006 & 2009) be recognized as District 24 Coach of the Year. In 2005, the team won its first ever South Jersey Group III State Sectional title in thrilling fashion over four-time defending champion Kingsway Regional High School. The following season brought a second South Jersey Group III title after dispatching Kingsway for the second straight year, taking five of the final six matches to win 34-27. In all, the wrestling program has produced six state champions, 23 region champions, and 51 district champions. It has earned two South Jersey Group III state sectional championships, two district championships, and seven Shore Conference divisional championships in its 46-year history. Central's last state place winner was senior, Jalen Ramos (now wrestling at Rutgers), who placed 8th at the NJSIAA Championships at Atlantic City's Boardwalk Hall in 2012. Ramos's 126 career wins are second only to Hall of Famer, Mark Worthy's 128 victories. Central Regional High School's marching band, the Marching Eagles, are a Group II Band in the Tournament of Bands circuit. Pam Boyd-Petroski (class of 1974), member of the 1984 United States Olympic women's handball team. Al Leiter (born 1965, class of 1984), former Major League Baseball pitcher who now serves as a television commentator. Mark Leiter (born 1963, class of 1981), former Major League Baseball pitcher. Megan McCafferty (born 1973, class of 1991), author best known for her series of books about Jessica Darling, a witty teenage heroine. Jeff Musselman (born 1963, class of 1981), former Major League Baseball pitcher. Central Regional High School Class of 1981. 1 2 3 4 School Data for Central Regional High School, National Center for Education Statistics. Accessed May 26, 2016. 1 2 3 Central Regional High School, New Jersey State Interscholastic Athletic Association. Accessed July 26, 2015. ↑ Staff. "The Top New Jersey High Schools: Alphabetical", New Jersey Monthly, August 16, 2012. Accessed August 22, 2012. ↑ Staff. "2010 Top High Schools", New Jersey Monthly, August 16, 2010. Accessed March 15, 2011. ↑ Top High Schools 201-316, New Jersey Monthly, September 2006, posted January 28, 2008. Accessed August 11, 2008. ↑ New Jersey High School Rankings: 11th Grade HSPA Language Arts Literacy & HSPA Math 2009-2010, Schooldigger.com. Accessed January 15, 2012. ↑ Central Regional High School, New Jersey State Interscholastic Athletic Association. Accessed March 24, 2015. ↑ School Info Archived September 30, 2007, at the Wayback Machine., Shore Conference. Accessed March 9, 2008. ↑ League Memberships – 2015-2016, New Jersey State Interscholastic Athletic Association. Accessed May 26, 2016. ↑ 2014-2015 Public Schools Group Classification: ShopRite Cup–Basketball–Baseball–Softball for South Jersey, New Jersey State Interscholastic Athletic Association, as of July 8, 2014. Accessed November 25, 2014. ↑ Strunsky, Steve. "Toms River police investigate death of former N.J. high school wrestler", The Star-Ledger, May 2, 2010. Accessed January 15, 2012. "Myers was a state wrestling champion in 1984 while at Toms River High School South, and then again in 1985 while at Central Regional High School in Berkeley." ↑ State Champions Archived April 21, 2012, at the Wayback Machine., New Jersey Wrestling. Accessed January 15, 2012. ↑ Christopher, Chris. "Central claims 1st sectional Eagles earn semifinal berth against Ocean", Asbury Park Press, February 18, 2005. Accessed July 4, 2011. "The top-seeded Golden Eagles Thursday night won their first state team sectional title in history pinning a 37-26 loss on Kingsway in the South Jersey Group III championship match." ↑ Lawrence, Ryan. "Central topples Kingsway", Asbury Park Press, February 17, 2006. Accessed July 4, 2011. "Visiting Central took five of the final six bouts Thursday night to derail Kingsway, ranked eighth in the Gannett New Jersey Top 20 poll, for the second straight season and claim the sectional title with a 34-27 victory." ↑ Adelizzi, Joe. "Jersey Shore Hall to add 16 members", Asbury Park Press, April 29, 2000. Accessed February 12, 2012. "Pam Boyd-Petroski, Central Regional: As a high school standout at Central, Boyd-Petroski starred in basketball and field hockey." ↑ Golden Eagles Athletics Hall of Fame: Pam Boyd Petroski ('74), Central Regional High School. Accessed February 12, 2012. ↑ Rushin, Steve. "World Series: 1993 - Home Sweet Homer", Sports Illustrated, November 1, 1993, accessed April 26, 2007. "'I don't give a —— how it feels,' said a laughing Leiter, whose last hit came for Central Regional High in Bayville, N.J., where he batted .220 in 1984." ↑ Golden Eagles Athletics Hall of Fame: Al Leiter ('84), Central Regional High School. Accessed February 12, 2012. ↑ Adelizzi, Joe. "Leiter side of baseball", Asbury Park Press, August 31, 2005. Accessed February 12, 2012. "It's been a while between autograph sessions for Mark Leiter, the former Central Regional star who put together an 11-year major league career." ↑ Golden Eagles Athletics Hall of Fame: Mark Leiter ('81), Central Regional High School. Accessed February 12, 2012. ↑ "Darling author returns to Berkeley", Asbury Park Press, September 25, 2007. "BERKELEY: Author Megan McCafferty, a 1991 Central Regional High School graduate, will visit the township branch of the Ocean County Library at 7 pm today." ↑ Kay, Michael. "YANKS DEAL LEITER FOR BARFILED", Daily News (New York), May 1, 1989. Accessed February 12, 2012. "[Al Leiter] is expected to step right into the Jays' staring [sic] rotation, replacing Jeff Musselman, who is undergoing alcohol rehabilitation. Leiter was a teammate of Mussleman's at Central Regional in Bayville, N.J."
↑ Golden Eagles Athletics Hall of Fame: Jeff Musselman ('81), Central Regional High School. Accessed February 12, 2012. ↑ Administration, Central Regional High School. Accessed September 7, 2014.